When I travel to Italy and am staying in one place for more than two nights, I prefer to rent an apartment. It is a great way to save money and to meet the locals. And honestly, you get more for your money when you rent an apartment. But where do you find these fabulous apartments, you ask? Meet Magda and Massimo Carli, owners of some of Florence’s friendliest apartments -- and your new friends. Magda and Massimo are both architects, and their apartments in the heart of Florence showcase their love of art, architecture, and beautiful details. Thoughtfully appointed, their collection of properties are all well-located and have all the conveniences that travelers need. I first encountered Magda and Massimo about five years ago when I rented one of their two bedroom apartments for a three-day stay. They stopped by to greet us while we were there, and we had a great chat. 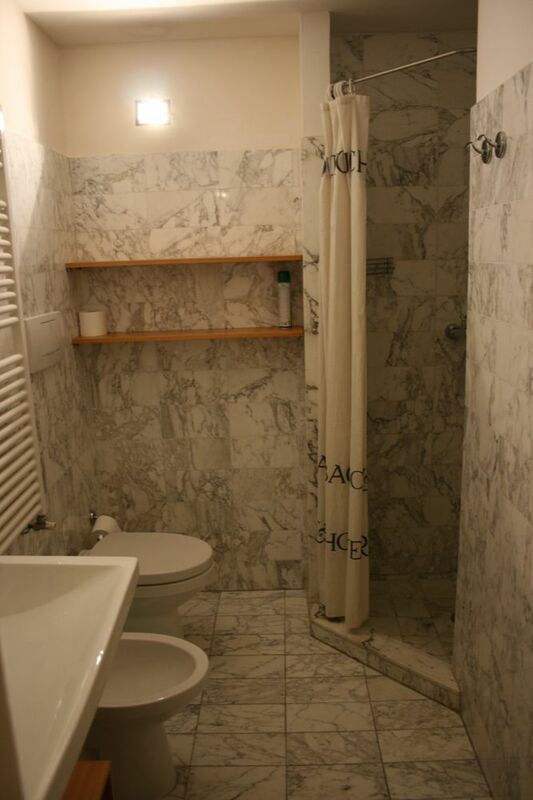 I recommended that apartment to several people over the years, and have kept up with Magda and Massimo over time. On another trip I rented their apartment in Venice and found it to be equally great, so when I was planning my trip to Italy this time, I knew it was time to check out all of their apartments. Full disclosure: in order to best review their apartments, Magda and Massimo allowed me to stay at their properties. Check out my review policy. My traveling companion and I stayed in the Magda apartment in Florence, and I spent a day checking out all of their other apartments in the city. Most of their properties in Florence are located on Via de Servi, a tiny cobbled street not far from the Duomo, a few blocks from the Academy, and within walking distance of all of Florence’s major destinations. This is an ideal location. There is a laundromat across the street from the apartment building and a great little cafe with fabulous coffee and pastries downstairs. The building is a mix of vacation rentals and local residents. It has an elevator, but you should only use the elevator for luggage as it is a bit touchy (yes, I got stuck in it and had to sheepishly call Massimo to help me out). Of all of their Florentine properties, I think the Via de Servi location is the best. Having said that, their Allegri apartment is also in a charming location though not quite so central for the first-time visitor. I have stayed in many apartments in Italy, and those owned by Magda and Massimo are among the nicest. The beds are comfortable. The apartments have all the necessities for a longer stay including furnished kitchens so you can prepare a simple meal, televisions and internet access, and collections of books. And they are attractive! It is a shame to spend time in a place so beautiful as Florence and to stay in an apartment that is not attractive -- and there are a few. In fact, in the Magda apartment, the two architects have cleverly created a “historic” fresco for effect as just one of the clever touches. There was one negative to staying in the Magda apartment: some street noise. One of the two bedrooms looks out on a street, and several nights there was noise to contend with as I fell asleep. My companion had no such problems as the other bedroom is across the apartment and far from the street. It wasn't so bad that I couldn't sleep, but I would be remiss if I didn't mention it. Perhaps the best part about renting from Magda and Massimo, however, is that they or their representative is available to you should something go wrong. One afternoon, for example, our apartment smelled slightly of gas. One phone call, and they were there to fix it -- or not as the smell was coming from construction on the street as it turned out. Their responsiveness is akin to that of a good hotel, but you have the relaxed atmosphere of an apartment instead. And an added bonus: Massimo leads architectural tours in Florence, too. My next trip to Italy will be a family reunion of sorts, and I am looking forward to staying on Via de Servi. After all with friends like Massimo and Magda in Florence, why would you look to stay anywhere else? For more information on Madga and Massimo’s apartments, visit their website: www.incentro.it. And be sure to tell them that you heard about their apartments on The Gypsy’s Guide! These are both really nice places. I think the Magda apartment is more of my style. The living room looks especially cozy. I loved this apartment. The location was amazing and the apartment beautiful and well appointed. I loved traveling with you, the best travel guide!